As I pondered this quote, I reflected not only on the past five years, but more specifically on the past six months of my life. In November 2015, I decided I wanted to find joy in my life again. I wanted to truly live instead of merely exist. But what needed to change so I could experience this? During Paul’s illness, I was a caregiver for both him and my children. I was exhausted most of the time and barely took any time for myself. As a result, I neglected some of my basic needs like eating healthy and exercise. Obviously, if you eat crappy and don’t exercise you gain weight. 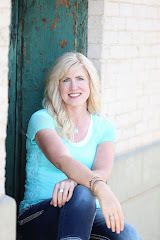 After Paul’s death, I was experiencing the many ups and downs of the grieving process. I spent hours praying to God, reading the scriptures, serving other people and expressing my gratitude, but something was missing. I needed to lose weight and I didn’t feel healthy. BUT… I had decided to accept myself for who I was. However, acceptance of ones self does not equate to self-love. My life changed for the better when I realized that eating unhealthy and lack of exercise was a crutch for me. It was not something to embrace, but something to overcome. So, I started to eat healthy and exercise. Here I am 6 months later, 30 pounds lighter and a whole lot healthier and happier! In this journey, I have discovered I can do more than I ever thought possible. And, yes, I have even learned to love vegetables! A few weeks ago I had an accident on my bike that left me with a broken ankle. I was devastated, not because of the pain, but because of the inconvenience. Exercise is for my mental therapy as much as it is for the physical aspect. I started to cry when the doctor told me no exercise on that ankle for at least a month. Fortunately, the fracture is not in a weight-bearing bone, so I was given a lovely boot to wear for the next month or two. Right after I had my accident I felt such frustration! I had worked so hard to achieve success…I was feeling a joy and happiness that I had not felt in a long time...now it felt as if it was being ripped from me. After having a few pity-party moments, I realized just because I have a broken ankle, it didn’t mean I can’t exercise. I just have to do it differently. After all, I had experienced worse things, like the death of my husband! And I already knew it was possible to learn how to do things differently. So, I decided to stop feeling sorry for myself and look for new exercise routines. What is the purpose of a trial? It doesn’t push you to do more of what you love or are already good at. It pushes you to do things you don’t think you can or want to do. If God only wanted us to do the things we love and are comfortable with, we wouldn’t need trials. So with this new trial, I have discovered that I am learning to focus on the areas of my body that were not as strong--my upper body and abs. I am unable to do the exercise I was already good at and loved. And, oh I how miss it! I see people out riding bikes or running down the sidewalk and I ache to participate. When my husband died, all the dreams and plans we’d made were shattered. Once I started to pick up the pieces, I realized that I can do more and be more than I thought. I have decided not to embrace widowhood, but to overcome it! I don’t have to embrace my broken ankle either, I can overcome it. When we embrace something that means we just accept it, but when we overcome something it means we have achieved success! 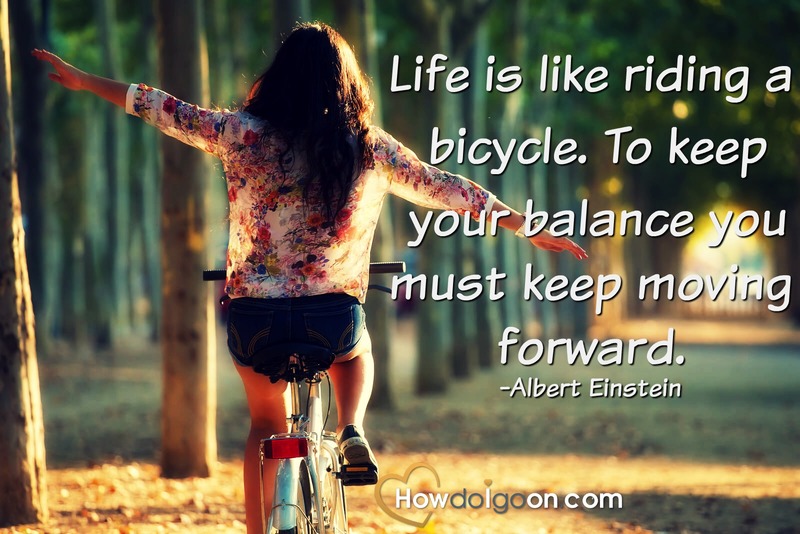 So, what is helping me to overcome widowhood? I have learned to intentionally seek out things that are new to me—things that may even scare me. Not long after Paul died, I bought a UTV and a trailer to tow it on. The first time I towed it I was scared out of my mind—mostly because I am not good at backing it up. I absolutely love riding the UTV and am happy to say I’m getting more comfortable with the trailer. 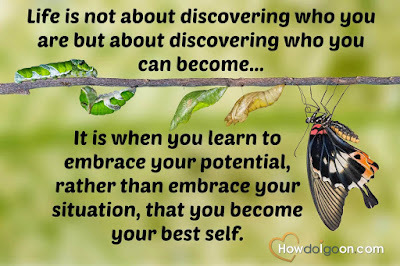 I believe life is not about discovering who you are but about discovering who you can become. 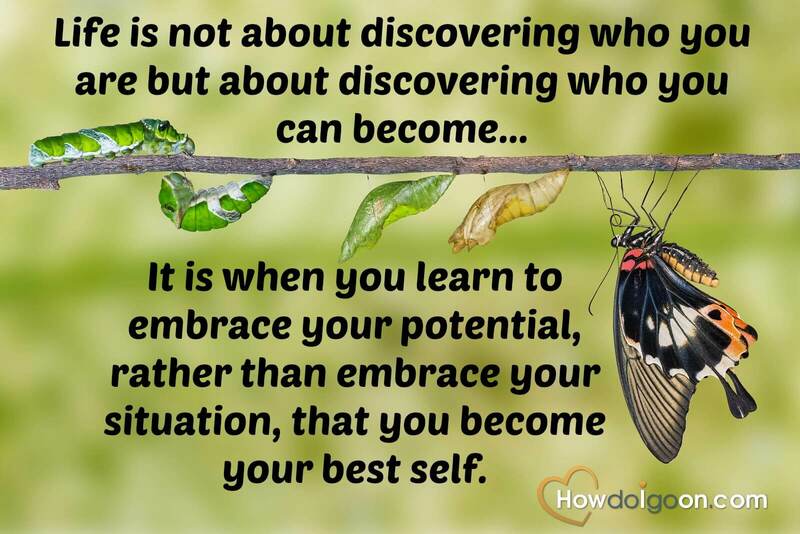 It is when you learn to embrace your potential, rather than embrace your situation that you become your best self. It is easy to do the things you love and are good at, but more satisfying and growth promoting to discover that you can do things you didn’t know you could. As mentioned in my previous post OVERCOMER, the first step to overcoming is turning to God through prayer and scripture study. The next step is to trust that He will help you find the different ways you can achieve and grow from your experiences—in essence helping you to achieve your highest potential! I ended up at the hospital with severe pain and a diagnosis of diverticulitis. After a few days in the hospital and 10 days of IV antibiotics I was finally on the mend. At the time I was really surprised that I had this situation arise. I had been eating really healthy and exercising—I was in the best shape I had been in since before I had my children. Isn’t it funny how, often as we look back on life’s experiences, we see those painful trials really prepare us for the next situation that is headed our way. I was stronger because of what I experienced and had a new understanding of pain and overcoming. Just a couple months after I had my hospital stay, my husband reinjured his back while helping someone move. He’d already had two previous surgeries from a broken back and this just proved to be more than his back could handle. With surgery finally scheduled in May 2010, we were hopeful that we might start to get our life back as we knew it. But no such luck. He was that “less-than-1% chance” something would go wrong. While moving his iliac artery over, a vein ripped and he bled out on the table. Yes, he coded. No pulse. No blood pressure. Miraculously, by the grace of God, and with the help of two vascular surgeons and 15 units of blood, he lived and had no brain or any other apparent damage. Just one problem…a big problem…his back still was not fixed. So, two months later we went back for another surgery. Obviously, since the attempt to perform the surgery the first time going through the front of his abdomen didn’t work, they opted to perform a spinal fusion through his back. This was successful. After a very painful and stressful six months, my husband was finally able to return to work. Little did I know at the time--those surgeries were just more stepping-stones in preparation for the next obstacle about to hit us. On November 28, 2011, we received a phone call that forever changed our lives. My husband, was told the horrific news that he had stomach cancer. It was a moment of sheer terror and disbelief. Within two weeks of receiving that phone call, he had surgery to completely remove his stomach. The surgery was only the beginning of our 14-month battle. There were issues with eating without a stomach, strictures forming in the esophagus, chemotherapy, scans, pain, vomiting, and severe weight loss. The list goes on and on. In July 2012, my dad had a massive heart attack. About three weeks after surviving a quintuple bypass surgery, he was finally allowed to go home. Four days after his return home my mom was rushed to the hospital with breathing issues. It was discovered that she had pneumonia. Two days later she died. My mom had been suffering beforehand from a weakened lung condition--the doctors figured she caught the pneumonia while visiting my dad in the hospital. On February 25, 2013, just six months after my mom died, my husband lost his battle with stomach cancer—leaving me a widow to raise our two young daughters. In September 2015, after feeling like I was getting my feet back on the ground, my father died. I have been pondering my life’s story. I am discovering life is about overcoming the pain…the fear…the sorrow…the disappointments…the loss. But how does one overcome these things? 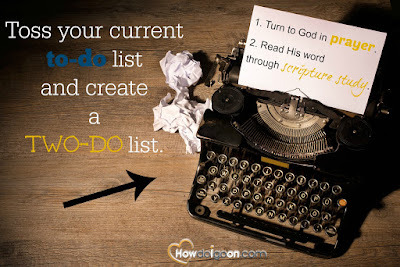 As a grieving person you have probably been provided with to-do lists to help with the grieving process through books, social media, family members, etc... But, how often do you actually DO what is written and/or prescribed? Grieving requires more than a mere written to-do list. It requires ACTION. It is in the action that we heal. Someone who is grieving tends to feel overwhelmed easily and often times forget the simplest of words or tasks. So, for someone to give you a long to-do list it can become daunting. 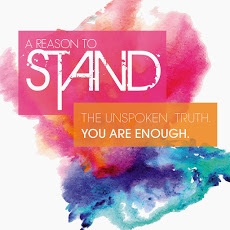 There is one word that best describes what has helped me the most in my grieving process. God. For today I am offering you this challenge. Throw away your current to-do list and write a two-do list. One, turn to God in prayer. Two, read His word through scripture study. Voila, now you have your two-do list! I have tried grieving both ways—with God’s help and without. And it is much easier to do this with His help! With God's help you can overcome your trials. Since my husband, Paul, died I have had moments of wondering why on earth Heavenly Father kept me here and took him. In all honesty, I always saw him as the better parent. He was better at so many things. Maybe that is why he was called home and I get to stay here—or maybe I am still here because that was just a part of our plan—my plan. It has taken me some time, but I have come to realize I am still here for a purpose. I have things to do and people to help. I can be an instrument in God’s hands. I can remember the times that I have wanted so desperately to be back with my Paul. Yes, I have prayed for death…that I would go to sleep and not wake up. Or maybe I would just happen to wander off the road and hit something hard enough that my girls and I would be reunited with my love. They were fleeting thoughts, but they did enter into my mind because the loss I was feeling hurt so deeply. As I read these verses, I was thinking about how the Apostle Paul wrote this while he was imprisoned. He had a desire for death so he could be with the Savior, yet he knew that he had a purpose here. It was more needful for him to be here and serve Christ because his ministry was not finished. There were others here who still needed his help. As a widow, like the Apostle Paul, I have experienced competing desires. It would be amazing to return to live with my Savior and my husband, yet I know that I have a purpose here. My work is not finished. I have beautiful children to raise and an amazing opportunity to serve Christ. The Apostle Paul was literally being held captive. As a widow, I have felt captive figuratively. It has been hard and so excruciatingly painful. At times, it really has felt like a prison sentence with little to no relief. The Apostle Paul recognized positive consequences that occurred as a result of his imprisonment. 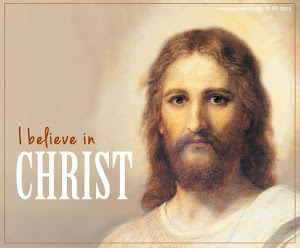 In Philippians 1:12 we read, “But I would ye should understand, brethren, that the things which happened unto me have fallen out rather unto the furtherance of the gospel.” And as we read in verse 14, “And many of the brethren in the Lord, waxing confident by my bonds, are much more bold to speak the word without fear,” he also recognized because of his example, other church members were able to be more bold and speak with confidence. Just as what transpired with the Apostle Paul, I have come to the realization that it is during those moments where we are imprisoned, we are also able to have the most impact and help others. God is able to utilize us to a greater capacity. Others are strengthened by our example. Others are lifted because we can show them compassion and empathy—they feel of our understanding because of what we have endured. No matter what your trial is, you have the ability to help others. You have a purpose. It is hard to find purpose when you are struggling to make it through the day and your heart is full of sorrow. Oh how well I understand. But it can be done--and needs to be done. When you find your purpose you find your peace. Finding our purpose requires action. It takes more than just thinking and pondering. It is in the doing that we discover our purpose. I discovered my purpose when I quit asking God questions such as, “Why did this happen to me?” or “What did I do to deserve this—was I not good enough?” and started asking, “What am I supposed to learn from all this and what is my purpose”? In essence, it was when I developed a greater relationship with God that I started to heal and find purpose in my life again. God helped me to remember what I was passionate about and then start to DO those things...I have even discovered new things with His help. Purpose is something that is plural in meaning. Most likely you have many things you can do. You don't have to just look for that "one thing" to give you purpose. Or maybe you only find "one thing" that gives you purpose and that is great too. So often we think that if we aren't able to impact a lot of people's lives for the better, we have no purpose. In our minds, little impact means big failure. Wrong! Having purpose doesn't mean it is your job to change the world--it simply means that you are living and not just existing. Having purpose can be something simple. You don't have to go looking for the grand when the small will suffice. Purpose is also something that is not stagnant--it can change and most likely will. 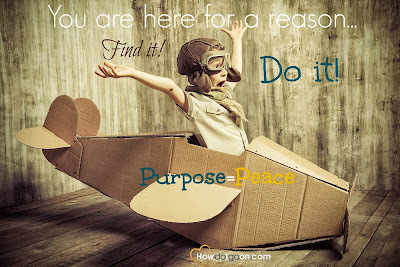 We should always be seeking our purpose! I ask God daily to help me find my purpose for that day. When I REMEMBER my purpose I find my peace. Yep, occasionally I forget my purpose…lose my peace...and then God reminds me again. I pray that you will find your purpose and find your peace. While seeking for your individual purpose, remember we all have a universal purpose. That purpose is to just BE. BE aware of God’s love for you. BE full of love for yourself and others. BE you! YOU have specific gifts that only YOU can share! What is your individual purpose for today? If you don't know your individual purpose, what are you going to do to discover it? How has recognizing your purpose brought much needed peace into your life?